Avista Stadium got ready for the new season with a major facelift. It’s only a week before the Spokane Indians begin their season, but the club’s front office still doesn’t know exactly who will be on their team. They’re finding that out on this sunny Friday afternoon, as an internet stream from Major League Baseball’s amateur draft plays over speakers from a cubicle on the far side of the team’s freshly painted offices. It’s like this every spring. Come June, Indians staff waits patiently for word to come down through the Texas Rangers farm system regarding who will don the Indians’ red-and-blue colors for the next three months. But while Indians management doesn’t have much say over which young men will take to the diamond this summer, they don’t have to wait around to get their ballpark ready. This offseason, the Indians, in conjunction with Spokane County, gave Avista Stadium — the club’s home since 1958 — a major facelift to the tune of $3.5 million. Fans might not have realized it, but much of the stadium’s infrastructure consisted of original 1958 buildings. The Indians have revamped offices and ticket windows, added a state-of-the-art concession stand, repaved walkways, and built a picnic area and flashy team store packed with Indians apparel that looks anything but minor league. You’ll notice all of this upon walking through the front gates, which also have been spiffed up. This is all part of keeping up with a baseball culture that has, over the years, required stadiums to up their game. No longer can a club — from the minor leagues all the way up to The Show — merely sell tickets, popcorn, watery beer and peanuts, and hope the product between the lines sells itself. Indians senior vice president Otto Klein, entering his 21st season with the organization, knows that he’s not just in the baseball business, but the entertainment business. Professional baseball has been played in Spokane for more than 100 years in one form or another, first at long-paved-over ballparks all but lost to memory. 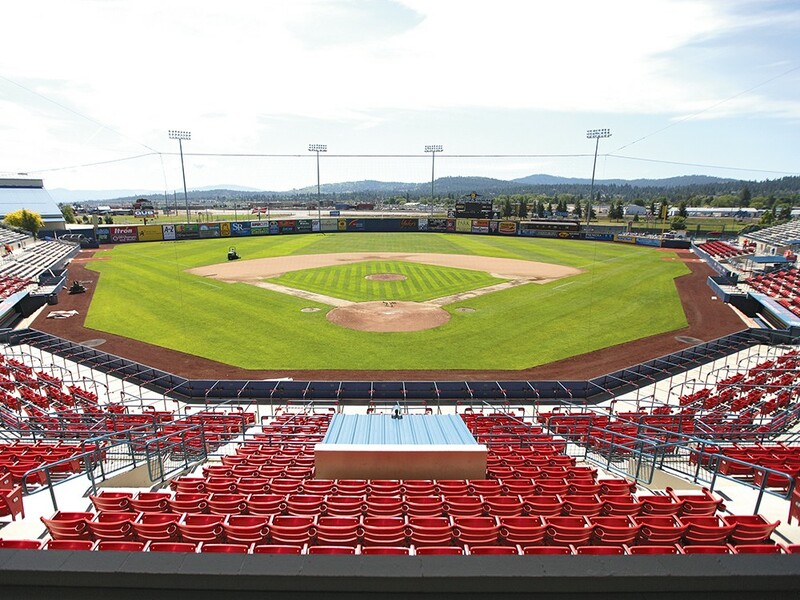 Around for 55 years, Avista Stadium has always been a national leader in attendance for short-season Class A baseball. In a given season, the stadium will be sold out as many as 10 times. The framework of the original 1958 offices remains, though the interiors have been completely redone. During renovation, the club’s history popped up in unexpected ways. After ripping up the floor of one office, workers discovered a safe embedded in the ground. It might have been from the Tommy Lasorda era, back when the Indians were the Dodgers’ AAA affiliate. Klein says they’re not sure what’s in there, but plan to open it up, perhaps even sometime this season. With the polished-up park now able to deliver gourmet cuisine, a bevy of beer choices and entertainment to keep the kids occupied during a less-than-riveting pitchers’ duel, you might wonder if the Indians are looking to step back up into a higher level of baseball. Remember, they are routinely filling a 6,800-seat stadium. That’s not in the cards, says Klein. First off, a longer season in Spokane would be dicey — Avista’s appeal wouldn’t be the same on a 45-degree April evening. Also, Klein says, they’ve got a good thing going here.